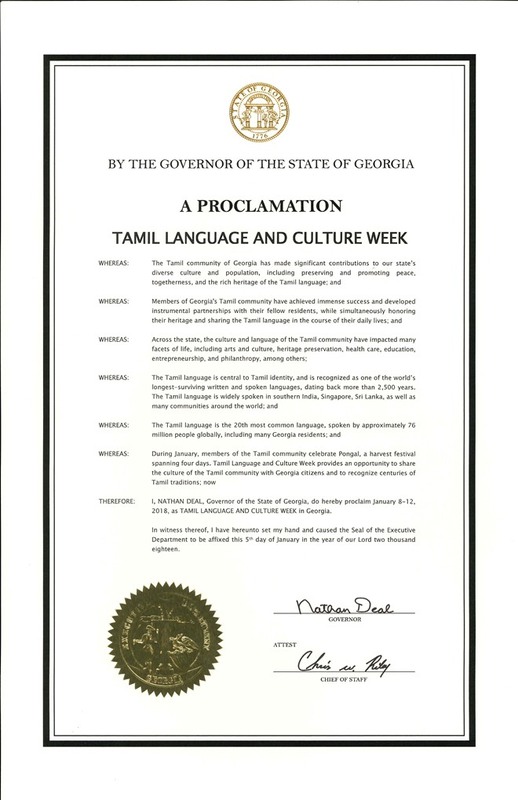 For the first time, the Governor of Georgia proclaimed a week as the Tamil Language and Cultural Week. 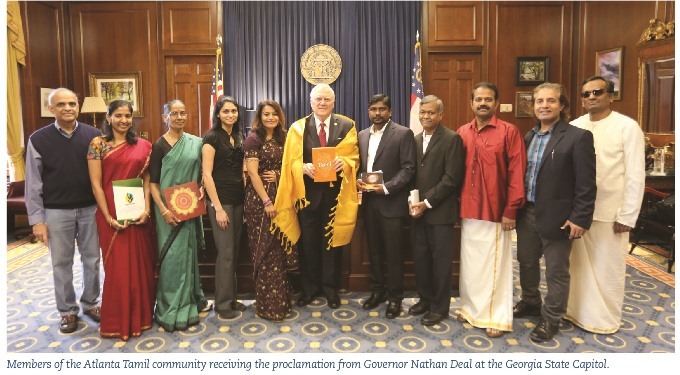 Governor Nathan Deal recognizes the contributions of the Tamil community across the world and within the state of Georgia, USA. Tamil is recognized as one of the seven classical languages, and it is one of the very few that has survived all the way through to the modern world. It has one of the oldest written traditions in all of Asia and boasts a rich body of literary work dating back 2,500 years. Tamil is now the 20th most commonly-spoken language (by c. 80 million people) in the world; it is predominantly spoken by the Tamil people of India and Sri Lanka. 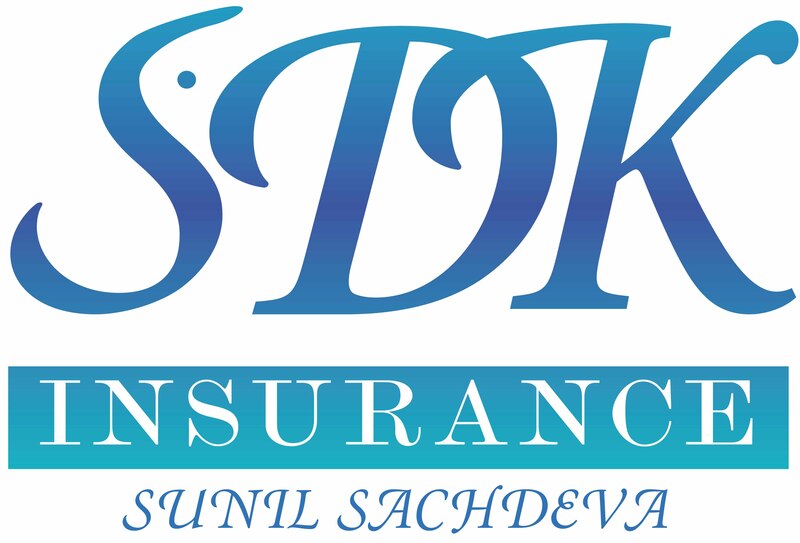 Tamil has an official status in the Indian state of Tamil Nadu, Indian Union Territory of Puducherry, Sri Lanka, and Singapore. The Tamil community is part of the USA’s diverse population and is committed to preserving its rich heritage. 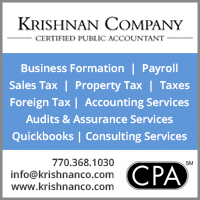 Tamil Language week (January 8-12, 2018) provided an opportunity to showcase and share the Tamil community's vibrant culture and traditions with Georgia’s residents and visitors. This week also included the most important Tamil festival, “Pongal,” which celebrates the hard-working farmers and the harvest season. Members of the Atlanta Tamil community received the proclamation from the Governor at the Georgia State Capitol. 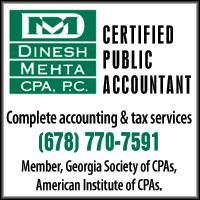 Governor Nathan Deal was felicitated by Dr. Nazeera Dawood. Mr. Vetri Selvan, the Harvard Tamil Chair global coordinator, spoke of the brotherhood of the Tamil diaspora. Harvard Tamil Chair is a recent initiative to establish an endowed professorship for Tamil at Harvard University to respond to the need for research in ancient Tamil literature to produce Tamil scholars trained in recent methodologies. The group was ecstatic as the Governor beautifully articulated the verse written 2,000 years ago by Tamil poet Kaniyan Poonkundranaar, “Yaadhum Oore, Yaavarum Kelir” (“All land is one, All are kith and kin”). Participants at the event were Sridaran, Jeya Maran, Mrs. Maragatham, Deepa Sriram, Dr. Nazeera Dawood, Vetri Selvan, Ramanathan Maran, Shiva Saravanan, Rajan Luthra, and Murugappan. Gwinnett County Board of Commissioners Chairman Charlotte Nash has also recognized the contributions of the Tamil language and the Harvard Tamil Chair endowment efforts, and earlier proclaimed December 2017 as Tamil Language Month.